Malbec – better than ever! I had never been a great fan of malbec, a grape that traditionally served as one of the five vinous components in red Bordeaux. Malbec is used to add weight and color to the Bordeaux blend, which may also be comprised of varying amounts of cabernet sauvignon, cabernet franc, merlot and petit verdot. But, in the past few decades, malbec has helped put Argentina on the world wine map as a single varietal. Malbec was first planted there in the late 1800’s, but it languished for decades as just another red wine. However, in the 1990’s vintners began to adopt better vineyard practices and started using up-to-date wine making equipment to produce a malbec that quickly became an international favorite. But I had never been fond of the wine. It seemed to me to be a bit over done, too rough around the edges and too tannic for my palate. I tried several different producers’ wines, but most of what was being made was just “too in your face” for me. But a few years back, things began to change for the better. Some producers, particularly those in the high altitude Mendoza region of Argentina, began to make malbec that was significantly more drinkable. For me, the improvement can be expressed in one word: balance. That had always been the missing ingredient in Argentinean malbec. In the Mendoza region where vineyards are planted at altitudes exceeding 3000 feet, malbec benefits from not only warm sunny days, but also from very cool nights that give the grapes enough natural acidity to balance the ample sugar, and assist in producing a very drinkable wine. But of all the good Malbec I‘ve had in the past couple of years, none compares with three wines I had the pleasure of sipping recently at one of the JQ Dickinson Salt-Works’ farm to table dinners. 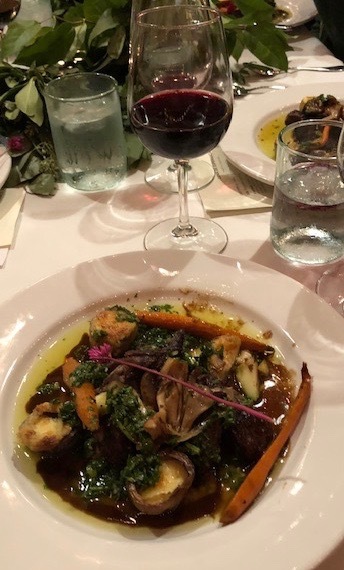 The dinner, exquisitely prepared by Chef Paul Smith of Buzz Food Service, paired three Argentinean courses with three malbecs from Luna De Esperanza, a small American-owned winery. Luna De Esperanza is located in the Uco Valley of Mendoza at more than 3700 feet above sea level. The tiny three-acre vineyard produces three wines that are deep, rich, full-bodied and age worthy. They are also wonderfully balanced and definitely show their best when paired with complementary foods such as the dishes prepared at the JQ Dickinson dinner. The three wines are available at the Wine Shop at Capitol Market. 2014 Luna De Esperanza Grand Blend ($49) – This blend of 70 percent malbec along with 10 percent each of cabernet sauvignon, cabernet franc and syrah is aged for 18 months in new French oak. With flavors of mocha and spice and nuances of licorice and cola, this is a very tannic, but well-balanced, wine. The Grand Blend was deliciously paired with two types of grilled sausages. 2013 Luna de Esperanza Super Premium Malbec, Uco Valley ($39)- Slightly lighter in texture than the Grand Blend, this malbec (90 percent) along with equal parts of cabernet franc and syrah has hints of blackberries and coffee. The medium tannins mask the silky texture of this lovely bottle. Paul Smith matched this wine with grilled hanger steak with a green chimichurri sauce. 2013 Luna de Esperanza Barrel Fermented Malbec, Uco Valley ($69) –This massive, 100 percent malbec was fermented in older oak barrels before spending 24-months in new French oak. With decadent flavors of rich dark chocolate and toasty oak, the wine paired seamlessly with Dulce de Leche – a bitter sweet chocolate and heavy crème concoction that was truly over the top!